Today my friend Sarah is defending her dissertation. She is the last graduate student in my lab (our PI is going to retire) so the celebration is going to be huge. 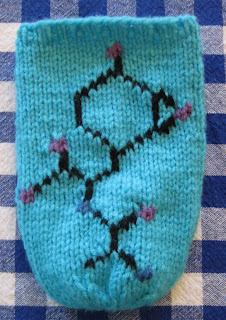 Like Marie, I wanted to send Sarah off with something to remember these graduate school years; a molecule knitting pattern that is relevant to her project. Bacilysin is a peptide based antibiotic, so this is an "antibacterial" beer cozy. Remnants of worsted weight yarn. Starting with the bottom row of the chart, and working from right to left, knit the 21 stitches in the first row of the chart. Finish the round by knitting 24 stitches in MC. Work the remaining 38 rows of the chart in the same manner. 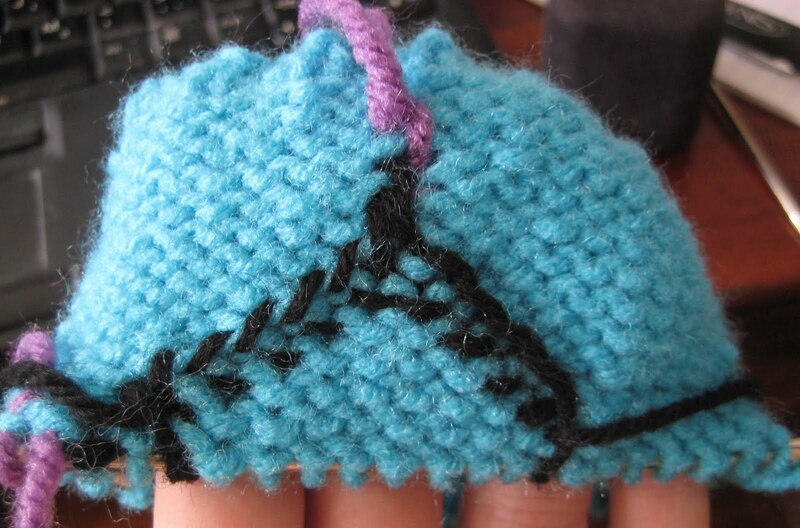 When I am working on these molecule knitting projects, I knit the molecule as I am knitting the rest of the cozy (see picture below.) If you prefer, you can knit the entire cozy and then use duplicate stitches to put the molecule on the cozy. The wrong side of the beer cozy.